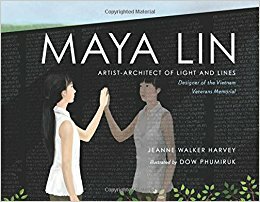 In 32 pages, including an author’s note, Walker introduces Chinese-American Maya Lin, who designed the Vietnam Veterans Memorial in Washington, D.C.
Phumiruk’s detailed sketches, created digitally in Adobe Photoshop with scans of watercolor and texture, convey a sense of wonder at the world as seen through the eyes of Lin. Phumiruk uses tones of green, brown, grays that reflect a child who was silent, observant, and found solace in nature. Maya Lin was studying architecture at Yale when, in her last year of college, she entered a contest to design a memorial to those who died during the Vietnam War. “The contest rules said that the memorial must blend with a park setting and include the names of every soldier who died fighting or was missing.” That is almost 56,000 names. Maya’s design was chosen out of 1,421 entries. When the judges discovered she was only a student, they were furious. Yet, Maya stood strong and eventually her design was approved. Harvey begins with Lin as a young girl and follows her journey, travel, college, the winning of the prestigious contest, and the building of the Vietnam Veterans Memorial. In one double-page spreads we watch the memorial being built and, turning the page, see the very personal experience individuals have visiting the memorial. Harvey ends this remarkable picture book biography briefly explaining Lin’s process for creating her projects. 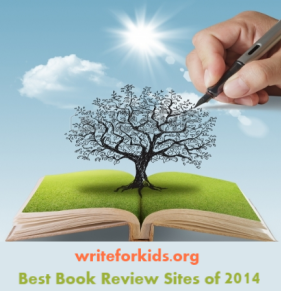 A good introduction to creativity, and the Vietnam Veterans Memorial for all ages. I read this book a few weeks ago. Loved it!